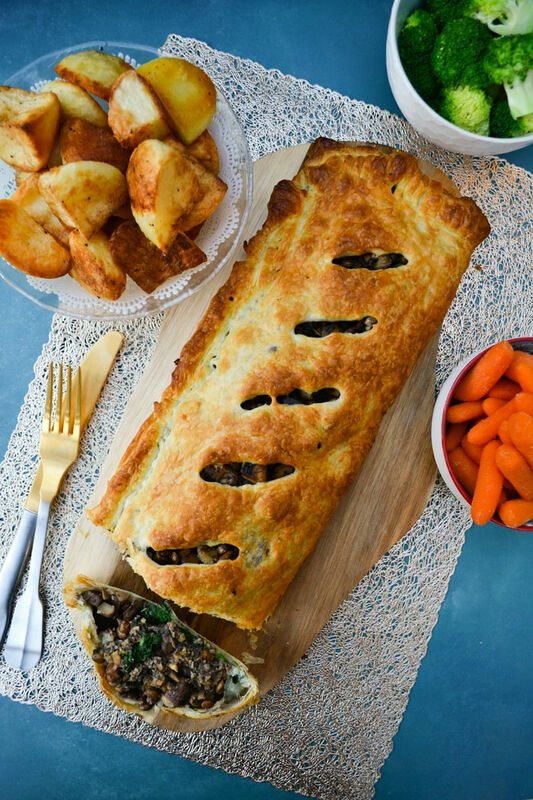 A traditional wellington is made with steak, pate and mushrooms in puff pastry. 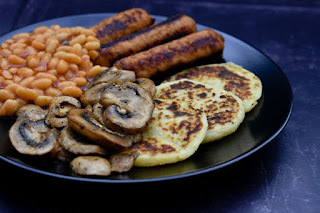 A thin crepe is often used between the pastry and filling to stop moisture leaking into the pastry, but I've found no need to do that with this vegan version. 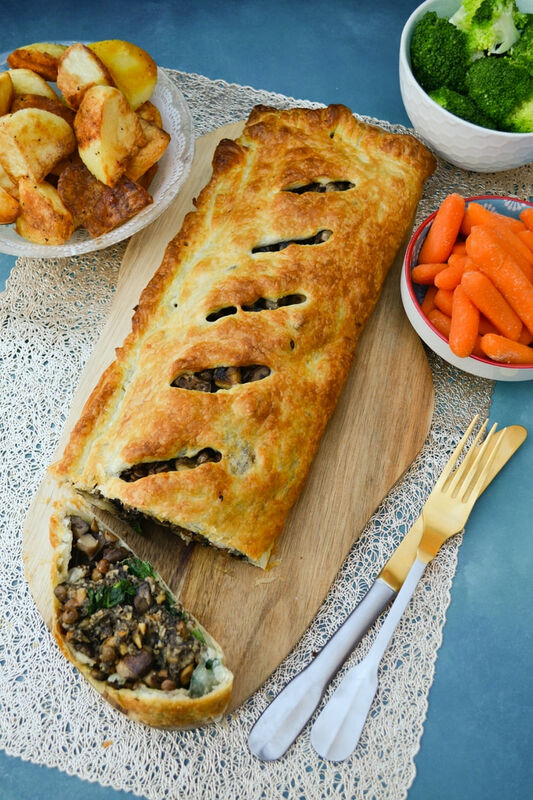 This vegan mushroom wellington is a crisp, golden puff pastry pie stacked full of flavour and texture. Layers of hummus, wilted spinach, mushroom pate and a mixture of thyme scented mushrooms, lentils and nuts. It's the perfect family dish to serve for Sunday dinner or for special occasions such as Thanksgiving and Christmas where everyone is gathered around the table to enjoy good food and good company. 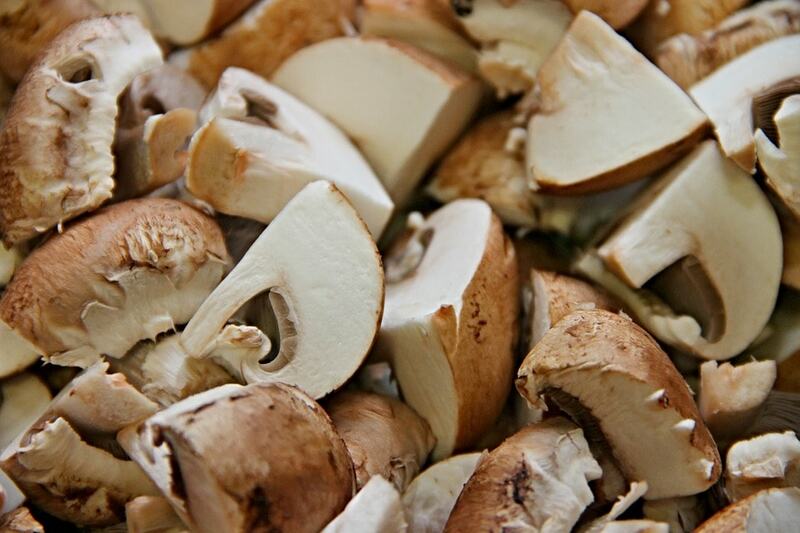 To get the best out of mushrooms and bring out all the flavour, you just need to take a little care. Before you think about cooking them you need first need to prepare them. NEVER and I mean never soak mushrooms as they will just end up wet and won't brown and take on all that lovely flavour. My advice is to trim the stem and peel the mushrooms. You can clean with damp kitchen paper, but to be honest it is easier to just peel them catching the edge near the stalk and peeling towards the top of the mushroom dome. A small vegetable knife useful for this. You choose the method, but NEVER soak them! Gently saute the mushrooms in a frying pan with a little olive oil over a gentle to medium heat. It really is worth taking your time with mushrooms. The most important thing is to season mushrooms while they are cooking. The soak it up and taste wonderful. You can also add garlic, fresh or dry herbs, red or white wine and vegetable stock or sometimes just a crumble of stock cube for added flavour. When I cook mushrooms to serve on toast or as part of a vegan cooked breakfast, I cook the mushrooms in a little olive oil and season with salt in pepper. It's best to keep the flavours simple and let the mushroom flavour shine. When I'm making a creamy mushroom sauce for pasta, I cook the mushrooms with garlic, season them with black pepper. After they've been cooking for a few minutes and released their juices, I add white wine, fresh herbs and sometimes a crumble of vegetable stock cube (not a whole cube, from a pinch to half depending on how much sauce I am making), then cook them gently for a few more minutes until most of the liquid has thickened. I then add the soya cream & creme fraiche. Delicious doesn't cover it. When I'm making a rich tomato based sauce or stew, I cook the mushrooms with garlic, salt and pepper, then add red wine and dried herbs, before adding the other ingredients. For this mushroom wellington, I added the mushrooms to sauteed chopped onion and garlic and continued to cook gently, seasoning the mushrooms as they cooked. I then added thyme (you can use fresh or dried), wine and half a vegetable stock cube crumbled in. I whizzed up a third of the mixture with oats and nuts to make a pate and added lentils to the rest of the mushrooms. Considering this is such a rich, luxurious pie for special occasions, it's not too bad health wise. As you can imagine with a pie wrapped in puff pastry it is fairly high in fat but not bad in calories. 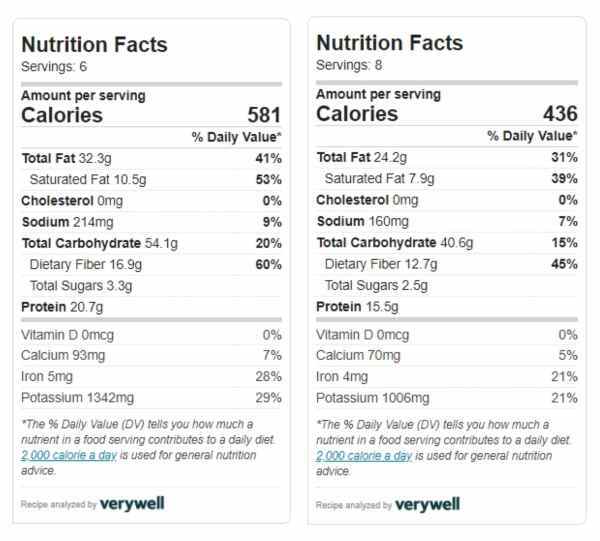 6 large slices contain 581 calories and 8 standard slices contain 436 calories. It is also high in protein, iron and potassium as well as containing some calcium. Preheat the oven to 200c/180c fan/400f/gas mark 6 and take the pastry out of the fridge. Remove it from the box and place the rolled up pastry on a plate and let it come to room temperature so it doesn't crack when it is unrolled. In a large frying pan saute the onion and garlic in 1 tbsp olive oil until it is soft, then add the mushrooms and cook them gently until they are soft as well. Season with salt and pepper then add thyme, red wine and then crumble in the half a stock cube. Gently cook until all the juices are gone, then turn of the heat. In a blender or food processor and whizz up a third of the mushrooms with the oats and nuts until you have a pate texture. Set aside. Add the lentils to the rest of the mushroom mixture in the frying pan and mix well. Rinse the spinach in a colander, then wilt the spinach by pouring a kettleful of boiling water over it. Refresh it with cold water, squeeze out as much water as you can then pat dry on kitchen paper. Carefully unroll the pastry and place it on a large baking tray, still on the baking parchment it was rolled in or on a baking sheet. Spread the hummus along one (long) side of the pastry leaving a border. Top with a layer of wilted spinach and the mushroom pate. Next top with the mushroom and lentil mixture. Brush a little water around the edges of the pastry. Pull the pastry over the filling and seal to make a large sausage roll shape. Crimp the edges with a fork and use a knife to cut diagonal slits in the top to let out steam. Brush with the rest of the olive oil. Bake or 20-25 minutes until golden and crisp. Serve slices with roast potatoes, vegetables and onion gravy. Calories and nutrition are for 8 standard slices. There are 581 calories in each of 6 large slices. 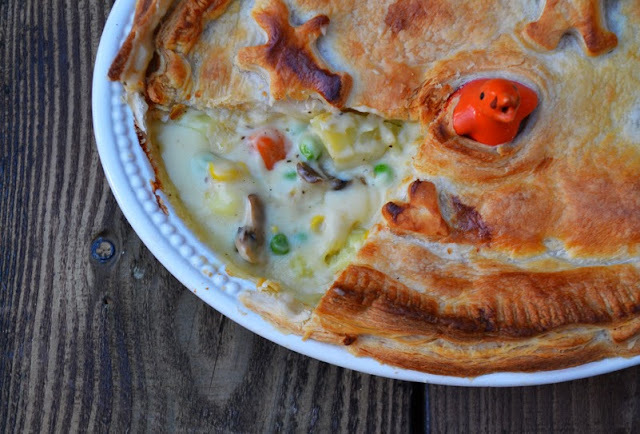 A gloriously golden puff pie filled with a selection of vegetables in a rich cheese sauce. Make vegetarian or vegan by choosing the appropriate sauce. Recipes included. For more Winter comfort dishes check out my food guide 48 Easy Winter Vegan Meals and have a look in my Veggie Christmas Page for a full roundup of Christmas recipes. This looks fantastic! I love mushrooms so much, and I'll never say no to puff pastry! I love them too and yes it is hard to say no to puff pastry ever! I have been looking for a veggie alternative for Christmas dinner and this looks perfect! Oh yes this is definitely the perfect dish for Christmas dinner. It would be good with a tomato sauce too, if you don't fancy gravy. 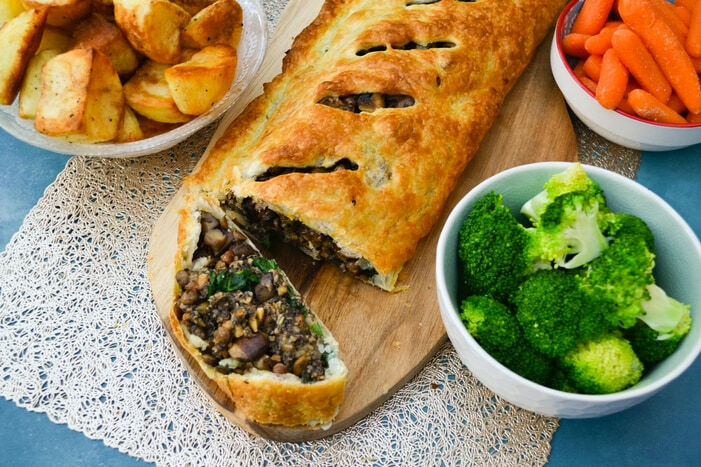 Oooh I've never tried a veggie wellington before but I have to say mushrooms are one of my favourite foods ever so I can just tell how delicious this would be! Oh my goodness you must, they are so tasty and easy to make too. All those layers sound heavenly, especially the hummus, which must boost the flavour profile beautifully. It does, the hummus worked so well with the other flavours and was different enough from the mushroom mixture to add another note. I love a good wellington and cannot wait to try your mushroom version! How delicious looking! Thanks Carmy. I do hope you try it. Let me know what you think. You can stuff pretty much anything in puff pastry and I'll eat it hah! These flavors do sound delish though - great recipes! Haha, I am with you there lauren, so tempting. Yes this was really good. This would do me very nicely for christmas dinner - just my sort of thing. I pinned it before I was halfway through the post. The recipe is fascinating - the hummus is something I would not think to do. But I guess it adds to the texture. I have been playing with a cashew cream that might do the same thing though it is a little thinner than hummus. And I am not a huge fan of mushrooms - a huge portobello mushroom in a burger is too much for me but I think they add great flavour and texture to any dish so am happy to eat them when they are in any dish. Maybe serve the cashew cream with it rather than in it Johanna. If it is thinner it could make the pastry wet and who wants soggy pastry? Do give it a go if you can manage how mushroomy it is or maybe half and half mushroom and aubergine? 2 out of 3 of my children will not eat mushrooms - They will always be an enigma to me who will eat anything with mushrooms in. I adore the sound of your wellington! Yes I am the same, I absolutely love mushrooms. Thanks Camilla and yes it's really good. This looks delicious! I am having a dinner party in a few weeks and wasn't sure what to cook for the veggies / vegans. Think I'm sold on Wellington now! What a delicious dish! I have never had a Wellington before. Have an amazing holiday week, Richa! Oh good, I hope everyone enjoys it as much as we did. Thank you, I have been looking for a suitable main course for my holiday dinners, so my vegan/vegetarian daughter feels included. I'm thinking I would like to try to make it early, do you know if this freezes well? Thanks again. I've not tried freezing it. Pastry udually freezes well but there is moisture in mushrooms so I am not 100% how good it would be. Why not buy ready rolled and prepare the filling a night or two before then you just have to fill the pastry before it goes in the oven? Made this for xmas dinner -- it did not disappoint! Absolutely delicious and beautiful. Definitely will be my new go-to for special occasions. Thank you!